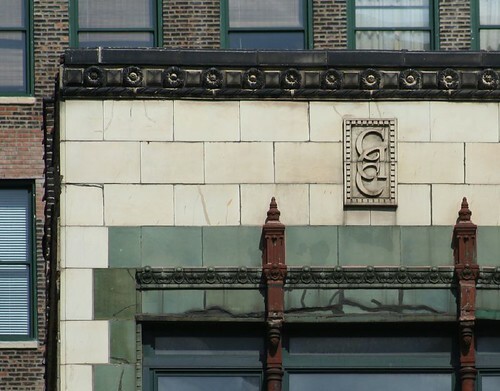 You've seen it; it's one of the mile-long row of architectural gems lining Michigan Avenue south of the river, just north of the landmark Auditorium Building. 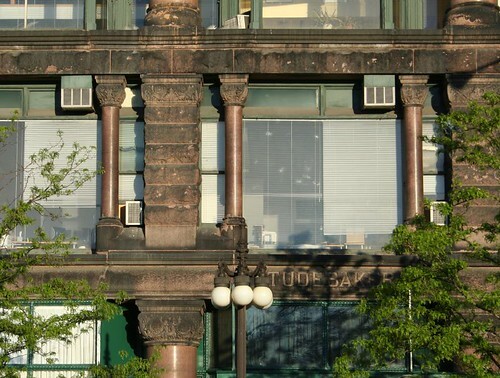 The Fine Arts Building was erected in 1885 to the designs of Solon S. Beman, as the Studebaker Building. Predating the automobile age, its upper floor were used to assemble wagons and carriages, while show rooms were in the wide-windowed lower floors. 13 years later Beman returned to the building, lopping off the top floor and adding three new ones in its place, and converting the building to a center of studio space for artists. It remains in this function today, housing architects, photographers, piano instructors, a violin maker, and many similar tenants. Tarnished by years of grime, it has a raw feeling of age that many of the more polished buildings around it lack. Its rough stone facade, brawny and massive, belies the fact that its facade contains very large areas of glass. At the base, the Artist's Snack Shop cafe offers outdoor seating, somewhat overpriced food, and an awe-inspiring neon and bulb-lit sign. Inside, the building offers a number of delights. 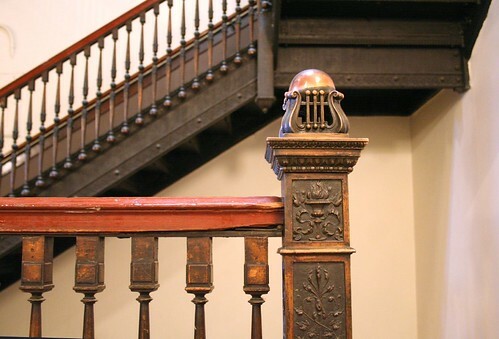 The corridors retain their original wood and iron work. 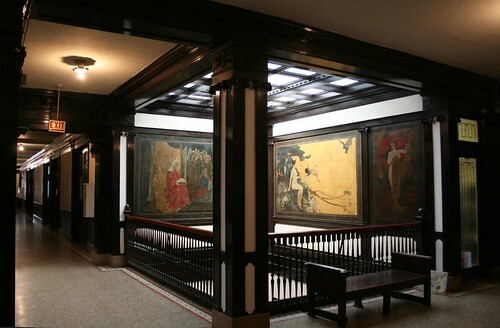 Murals decorate a central light well adjacent to the main stairs and other places. A top-floor ballroom features ornate light fixtures and sweeping views of the lake and Grant Park. 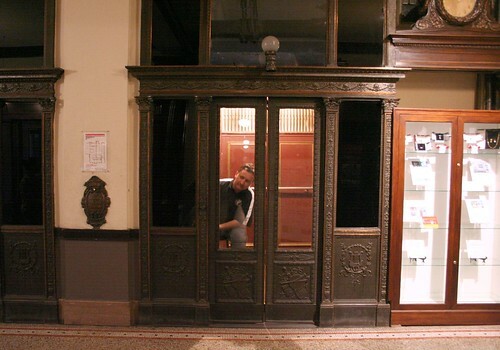 Equally vintage are the elevators, with all their original metal trim intact. 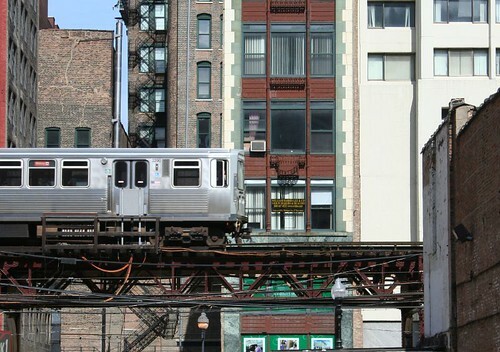 The system requires an operator, who flashes past the floors in a slow streak of light as the cars go up and down. 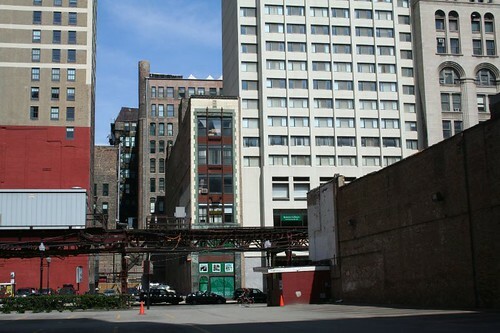 Behind the building, facing Wabash and the rails of the L, stands an incredibly thin building, at 421 S. Wabash. 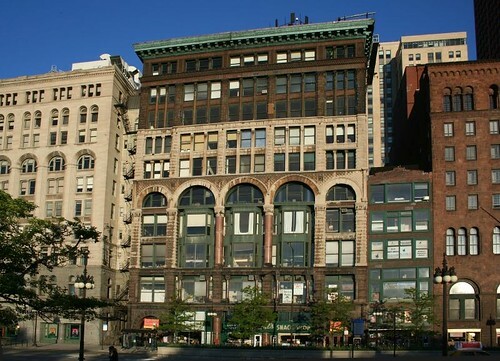 Built as the Fine Arts Building Annex, it dates from 1924, was designed by architects Rebori, Wentworth, Dewey & McCormick, and housed heating equipment and additional studio space. The "Rebori" in the architectural firm is Andrew Rebori, who did renovation work on the main building, and went on to design some amazing Art Deco around Chicago. The building's emphatic verticality, reinforced by two slender pilasters running the full height of the facade, is distinctly Chicago School. 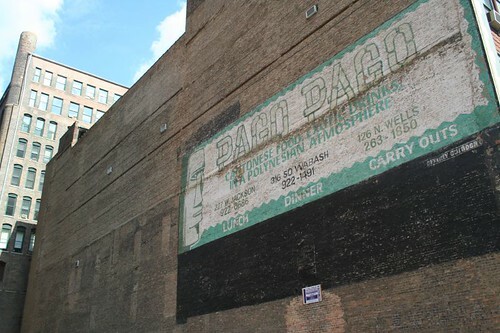 The side of the annex is a vast wall of common Chicago brick, with a painted ad for a Tiki restaurant called Pago Pago. The Fine Arts Building has its own web site, proudly proclaiming its continued status as a haven for artists. Awesome that you went inside - I've only ever seen the cafe. I wonder what was next to the annex that motivated them to build such a narrow sliver of a building? Fixed, and thank you! That's unfortunate news that the Annex is threatened. It's funny, I didn't even realize the two buildings were related, but I'd been planning entries about both of them. Then I sat down to write about the Annex, realized what it was, and figured, two birds with one post. what a delight! it was wonderful to see the 10 floor murals. there was a wonderful ballet school in the space to the right of the murals and curtis hall. i have a friend who remembers when both theatres (one screen one stage) on the first floor and a memorial chapel occupied one of the large studio on the south side of the building and incense wafted down the penthouse stairs from a mysterious yoga studio.